An interactive book about girl’s dowry, which stored in the chest box. Welcome to the magical world of ethnic ukrainian art, where ancient artifacts and modern technology creates the magic. 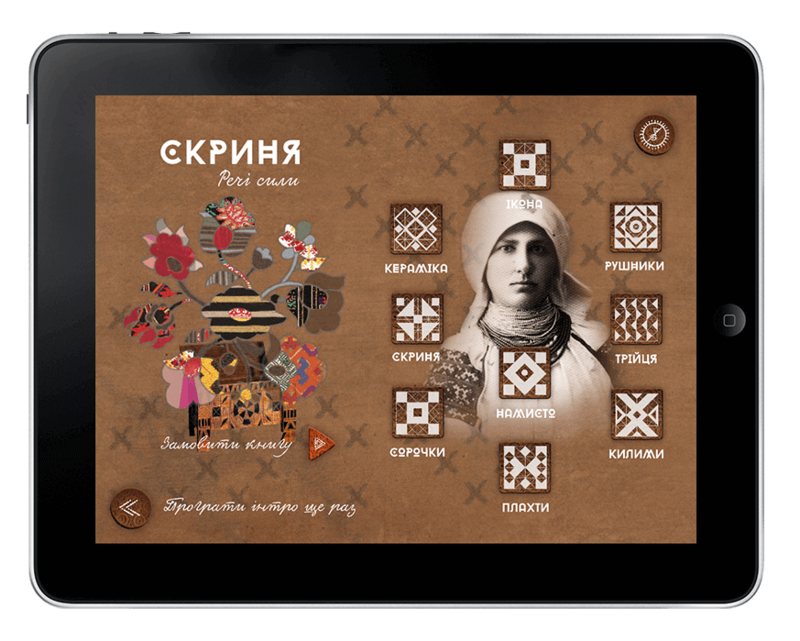 Do you want to see how hutsul tiles revive and coloring by yourself Bukovynian old icon? How about a personal acquaintance with the Patterns Keeper? In the book you can hear the voice of Sergei Fomenko the bandleader of “Mandry” and Ivanka Chervinska, the finalist of “Voice of the country”. Animated book consist of 9 chapters – only 36 pages. “Chest” scrolling can be more than one hour. The audience look in to virtual chest box, in which dowry is collect from the girl birth. Alive pictures of the book – the real old Ukrainian chests, ornaments, costumes, hats, towels and other national artifacts collected throughout Ukraine from Lviv to Donetsk.